It's a testament to his growing appetite that our 12-year-old can pack away the tons of food given away at the recent gluten-free vendor fair in northern New Jersey and ask to stop for lunch on the way home. As it happened, traffic was slowing as we approached Exit 8A of the Turnpike. We got off the highway and snaked our way down to Lawrenceville, Mercer County, where WildFlour Bakery & Cafe (2691 Main St., 609-620-1100) was in the middle of a brisk weekend brunch service. 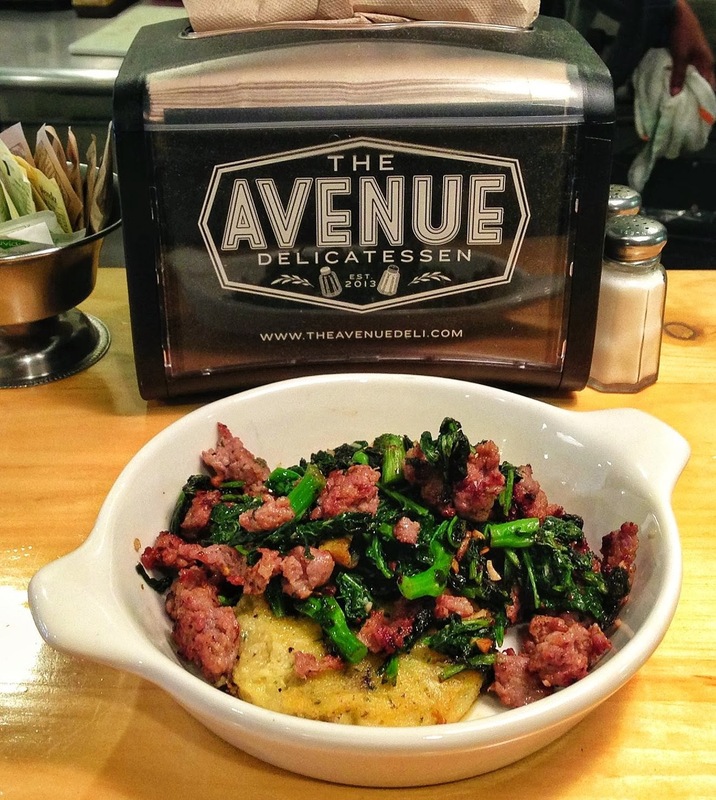 Marilyn Besner opened the all-gluten-free eatery - the only one of its kind in southern New Jersey - in May at the former Lawrenceville Inn, and she has maintained the quaint, homespun feel of the former occupant. 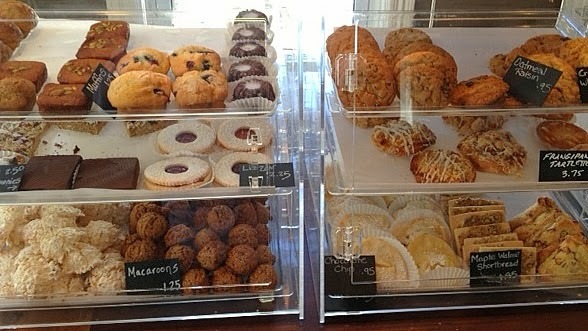 The fresh-baked breads that Besner and her energetic staff sell by the loaf are used for several cafe items, including grilled cheese. My son raved about his egg salad sandwich on pumpernickel ($6.25), while I loved the Nutella-stuffed crepe ($6.95), sprinkled with berries and topped with vanilla ice cream made by The Bent Spoon in neighboring Princeton. There are also savory versions made with either buckwheat or vegan-friendly rice and lentil. 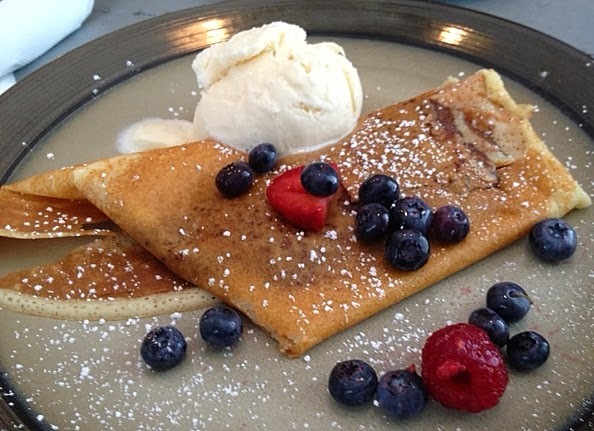 Pancakes ($4.50), salads ($6.95), a soup of the day ($3.25) and smoothies ($6.25) round out the menu. 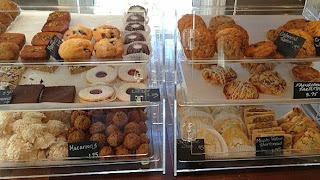 A display of delectable sweets at the front counter can't be avoided. 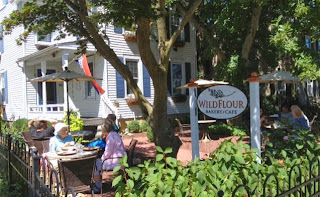 WildFlour's assortment includes iced fruit danish ($1.95), a nutty Frangipane tartlette ($4.25), and off-menu items like Linzer cookies and custard flips. The menu at Italian-Jewish deli mashup The Avenue in Lansdowne (27 N. Lansdowne Ave., 610-622-3354) lists gluten-free breakfast items like corned beef hash and spiced quinoa porridge and dinner entrees such as mushroom polenta cake. Other items can be adapted. One of Philadelphia's oldest Indian restaurants, Minar Palace (1304 Walnut St., 215-546-9443), has gluten-free options noted on the menu. 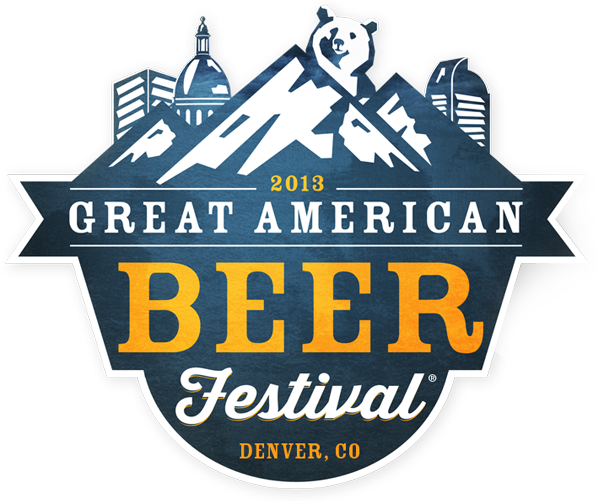 Although the Great American Beer Festival, the premier U.S. beer festival and competition, was founded in 1982, the Gluten-Free Beer category has only been a part of the event since 2007. At this year's competition, held last week in Denver, Harvester Brewing of Portland, Oregon took the Gold medal for its Harvester Brewing IPA No. 1. A gluten-free Pale Ale made by Deschutes Brewery's Bend (Oregon) Public House won the Silver medal, while Colorado's New Planet Beer Company earned a Bronze medal for its Brown Ale. What used to be District 611 in Riverton, New Jersey is now District Riverton Bistro (710 Broad St., 856-499-2916). Gluten-free options on the BYOB's dinner menu include pan-roasted branzino and a pear arugula salad. Just off Haddonfield's main drag on Kings Highway is Marie's Sandwich Bar (6 Kings Ct., 856-375-2449), which is now serving gluten-free hoagies. 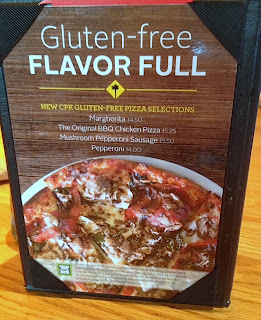 In last Tuesday's blog post, I focused on new gluten-free pizzas and sweets that were sampled at last month's Expo East products event. This week, the spotlight turns to baked goods, ice creams and salty snacks. 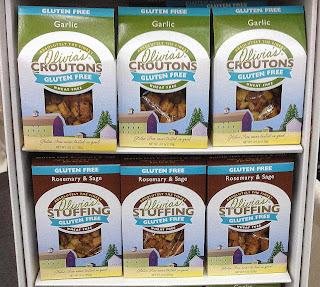 Olivia's Croutons owners Francie and Dave Caccavo established a dedicated facility in Middlebury, Vermont to produce its new scratch gluten-free Garlic croutons and Rosemary & Sage stuffing. 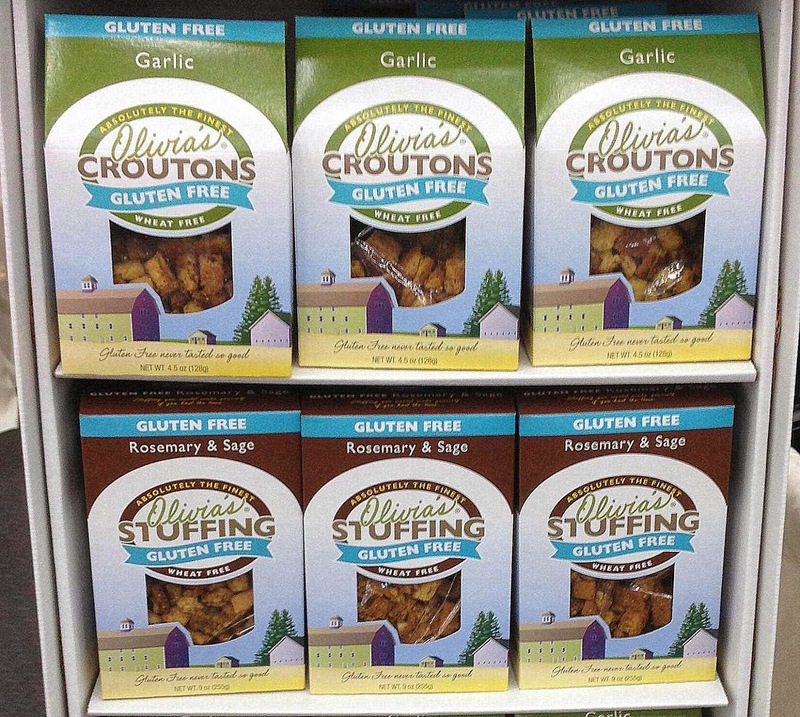 The bread base for both products is made with millet, sorghum and brown rice and white rice flours. Olivia's products are available for purchase online and in stores throughout the country. Natural Products Expo East, held in Baltimore each September, is an opportunity for both emerging and developed companies to showcase their products for retailers and distributors. 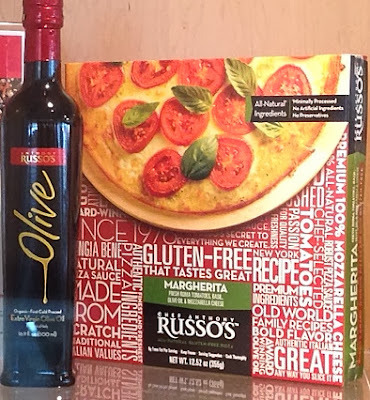 Here's a look at some gluten-free products that are either on their way to market to stores or gaining wider distribution. 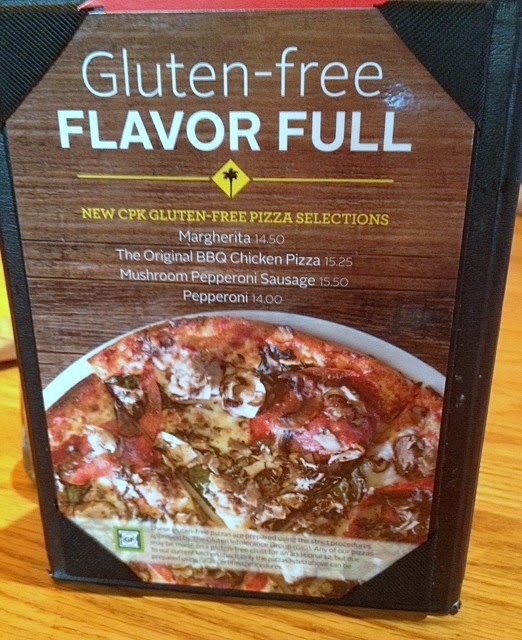 A Texas pizza chain sampled retail versions of its gluten-free pizza. Russo's New York Pizza has six crispy pizza varieties, including the excellent Mulberry (Italian sausage, pepperoni, Canadian bacon and hamburger), that will be making their way to markets. 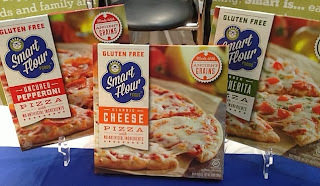 Smart Flour Floods was one of many companies at the expo hailing from Austin, Texas. Smart Flour's frozen pizzas were distinctive for their ancient grains flour base. The crusts in the new Classic Cheese, Garden Margherita and Uncured Pepperoni varieties are made with a blend of tapioca, sorghum, teff and amaranth flours. These are free of soy, egg and rice. The Pepperoni pizza won the expo's "Best New Food" award.